ASM DataCore offer their clients a wide range of safe document storage facilities. Ideal for the external storage of archive boxes, with a range of box or file retrieval options included. 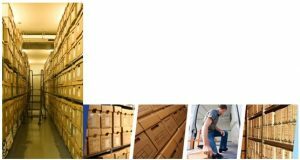 British companies are becoming increasingly aware of the benefits of off-site document storage. Employing ASM DataCore for your document storage/management, companies employ available working space and retrieve paperwork quicker and easier, if required. ASM DataCore reassure clients their documents are securely held in a fully protected facility. Access is restricted to authorized personnel or company representatives that have undergone security screening. The company affords their clients inexpensive storage space while bringing the finest data management on offer. Highly trained staff work alongside their clients to design an inventory system specially tailored to fit their company. Individual storage boxes can are carefully indexed on computer for ready identification on arrival at ASM DataCore’s premises. Clients then receive a complete report, either electronically, on a computer disc or hard copy printout. It catalogues the contents and reference number of each and every box. If a client requires efficient information retrieval then ASM DataCore will locate the box immediately. Then, through the use of ASM DataCore’s rapid delivery uplift service, the documentation reaches its destination inside two hours. Now many businesses are choosing to ‘go paperless’ scan on demand is the obvious solution. To benefit from scan-on-demand, get in touch with ASM DataCore today on 01264 336007. Rather than digitise all your documents in one go, by utilising our scan-on-demand option, you can gradually digitalise all of your documents step-by-step rather in all one go. Scan-on-demand is particularly advantageous to large businesses who store many thousands of paper documents. Fast Access to information that is in deep storage is critical to the operation of a successful business. There will be many times when you need access to your offsite documents immediately. Companies with large operations in various locations often need access to the same documents at the same time. To facilitate these situations we offer a scan-on-demand service by combining our document storage and scanning services. To complement our scan on demand we offer a scan on demand plus solution. For an agreed monthly fee we collect and store all your documents and scan the agreed proportion of your archive on a monthly basis. The document storage element of this service is free of charge. When an urgent retrieval is requested dependant on the volume of documents in storage an agreed number of retrievals will be considered as part of the current month’s quota. The Most Cost effective alternative to physical file delivery. Digitised documents are available anytime, anywhere and to any of your personnel who have the required permissions to access the digitised data via secure web access.